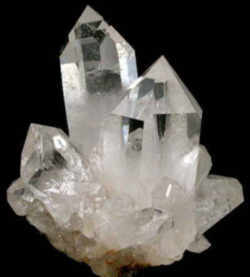 The quartz crystal, (SiO2,)was adopted as the Arkansas State Mineral by the General Assembly of 1967. Quartz crystals are mined in the Ouachita Mountains and are used in computers and sold to visitors to our state. Sometimes called "Arkansas diamonds," quartz crystals are not true diamonds. Arkansas is one of a small number of places in the world with enough quartz crystals to justify commercial mining. Though the amount of un-mined quartz in the state is not yet known, Arkansas does have, in terms of both size and quality, some world-class deposits of quartz. Quartz is a common mineral that becomes crystallized under extreme geologic pressure. These crystals have been used to make oscillators for radios, computer chips, and clocks. Quartz crystals are also valued for their beauty as mineral specimens and gemstones. In 1819, Henry Rowe Schoolcraft, the naturalist and explorer wrote, "One of the most noted localities of this mineral west of the Mississippi River is the Hot Springs of Ouachita in Arkansaw Territory. At this place numerous pieces of quartz have been found, very pure and transparent, and beautifully crystallized...."
Arkansas is the number one producer of quartz crystals in the United States and probably the world. They occur in abundance in the Hot Springs area. Quartz or silica is a hard, usually colorless or white, insoluble mineral. Quartz crystals and veins are a common feature of the Ouachita Mountains region of Arkansas. Arkansas quartz crystals are widely known for their clarity and for their habit of occurring in attractive clusters. Quartz crystals are important in the construction of radio equipment, range finders, direction-finding apparatuses, periscopes, gun sights, polariscopes, and other precision equipment. During World War II Arkansas quartz crystals were used particularly in radio equipment. A large chunk of crystals from Mount Ida in Montgomery County occupies a prominent position at the Museum of Natural History in New York City. Color is as variable as the spectrum, but clear quartz is by far the most common color followed by white or cloudy (milky quartz). 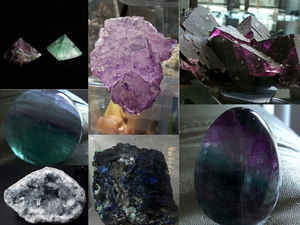 Purple (Amethyst), pink (Rose Quartz), gray or brown to black (Smoky Quartz) are also common. Cryptocrystalline varieties can be multicolored. 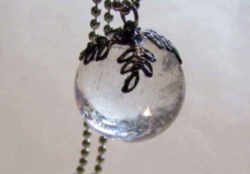 Luster is glassy to vitreous as crystals, while cryptocrystalline forms are usually waxy to dull but can be vitreous. Crystal System is trigonal; 3 2. Crystal Habits are again widely variable but the most common habit is hexagonal prisms terminated with a six sided pyramid (actually two rhombohedrons). Three of the six sides of the pyramid may dominate causing the pyramid to be or look three sided. Left and right handed crystals are possible and identifiable only if minor trigonal pyramidal faces are present. Druse forms (crystal lined rock with just the pyramids showing) are also common. Massive forms can be just about any type but common forms include botryoidal, globular, stalactitic, crusts of agate such as lining the interior of a geode and many many more. Cleavage is very weak in three directions (rhombohedral). Hardness is 7, less in cryptocrystalline forms. Other Characteristics: Striations on prism faces run perpendicular to C axis, piezoelectric (see tourmaline) and index of refraction is 1.55. 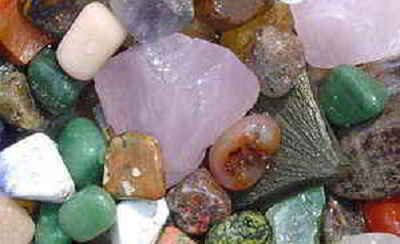 Associated Minerals are numerous and varied but here are some of the more classic associations of quartz (although any list of associated minerals of quartz is only a partial list): amazonite a variety of microcline, tourmalines especially elbaite, wolframite, pyrite, rutile, zeolites, fluorite, calcite, gold, muscovite, topaz, beryl, hematite and spodumene. Notable Occurrences of amethyst are Brazil, Uraguay, Mexico, Russia, Thunder Bay area of Canada, and some locallities in the USA. For Smoky Quartz; Brazil, Colorado, Scotland, Swiss Alps among many others. 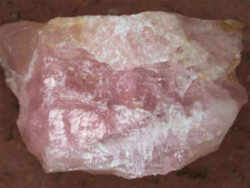 Rose Quartz is also wide spread but large quantities come from brazil as do the only large find of Rose Quartz prisms. Natural citrine is found with many amethyst deposits but in very rare quantities. 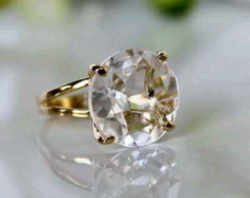 Fine examples of Rock crystal come from Brazil (again), Arkansas, many localities in Africa, etc. Fine Agates are found in, of course, Brazil, Lake Superior region, Montana, Mexico and Germany. Best Field Indicators are first the fact that it is very common (always assume transparent clear crystals may be quartz), crystal habit, hardness, striations, good conchoidal fracture and lack of good cleavage. The law designating the Quartz crystal as the official Arkansas state mineral is found in the Arkansas Code, Title 1, Chapter 4, Section 1-4-111 - State gem, mineral, and rock. § 1-4-111 - State gem, mineral, and rock. 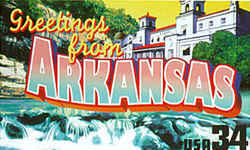 (a) The diamond is adopted and designated the official state gem of the State of Arkansas. (b) Quartz crystal is adopted and designated the official state mineral of the State of Arkansas. (c) Bauxite is adopted and designated the official state rock of the State of Arkansas. History. Acts 1967, No. 128, § 1-3; A.S.A. 1947, § 5-115 - 5-117. 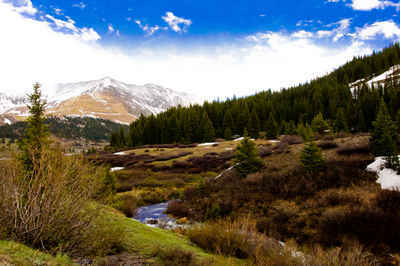 Environment Sedimentary, metamorphic, and igneous rocks. Locality Very common mineral found world wide. Name Origin From the German "quarz", of uncertain origin.